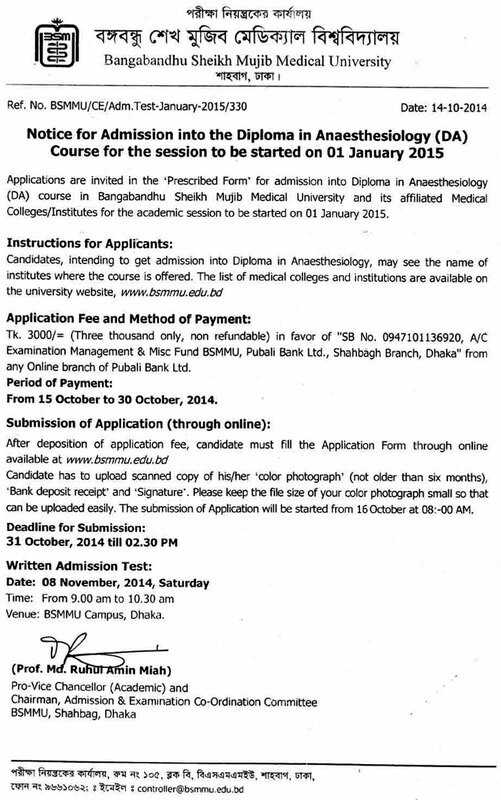 Diploma in Anesthesiology Admission Circular January 2015 | BSMMU. Diploma in Anesthesiology Admission Circular under Faculty of Surgery in Bangabandhu Sheikh Mujib Medical University (BSMMU) has been published. It will provide a good opportunity for those Doctors who want to build their career in Anesthesiology. The details circular is available here. The interested candidates can apply online from 16 October, 2014.
leave rules of their employer. BMDC Permanent registration certificate valid upto 30th June 2015. 3) Maximum 45 years age as on 31st December 2014. The candidate has to deposit Taka 3,000/- in any online branch of Pubali Bank Ltd in favour of SB A/C No. : 0947101136920, “EXAMINATION MANAGEMENT & MISCALLENIOUS FUND”. There can not be more than one entry with the same Bank Scroll No. with deposit date. After deposition of money candidate can fill the application form through online. Candidate must scan his/her passport size colour Photograph, Signature and Bank Receipt before filling the application. Step 1 : Sign up (Brif personal information and Bank account). Step 2 : Detail personal information and uploading of scanned documents. How many Institutions can a Candidate can give? This entry was posted in Notice and tagged BSMMU, BSMMU Diploma in Anesthesiology Admission, Diploma in Anesthesiology Admission, Diploma in Anesthesiology Admission Circular, How to Apply for for Diploma in Anesthesiology by Result Gov BD. Bookmark the permalink.